December is a popular month for Antarctic travel as the warmer temperatures and increasingly long days breathe life back into the region. Wildlife numbers are increasing and hungry humpback whales start arriving. Look out for the first penguin chicks which start to hatch. For those who like to have their cake and eat it, early December is a great time to travel. Warmer weather, long days to explore and maximum wildlife encounters, but at lower Shoulder Season pricing. It exceeded our expectations and I would recommend it to everyone wanting to go visit Antarctica. We had a really wonderful time. So glad we flew! Mind blowing, once-in-a-lifetime trip. I would go back in a heartbeat. It far exceeded any expectations I had and I absolutely fell in love. The landscape was beautiful. I wanted to go early in the season to see white - snow, icebergs, clear landings. And I definitely saw that! Have recommended Swoop to all our friends; more than happy with your service before, after and during our trip. We had an absolutely amazing honeymoon in Antarctica. One I'm sure we'll never forget. Highlight was the wildlife and the staff; we learned so much and had so much fun. Thanks for all your help! By December, the Antarctic summer is in full swing. Long days for exploring, hatching penguin chicks and the return of humpbacks all mark the beginning of High Season. Its action stations in the penguin rookeries in December with the chicks about to hatch. Peek into the nests or listen out for the 'keening' sound they make - it's like looking for Christmas presents. 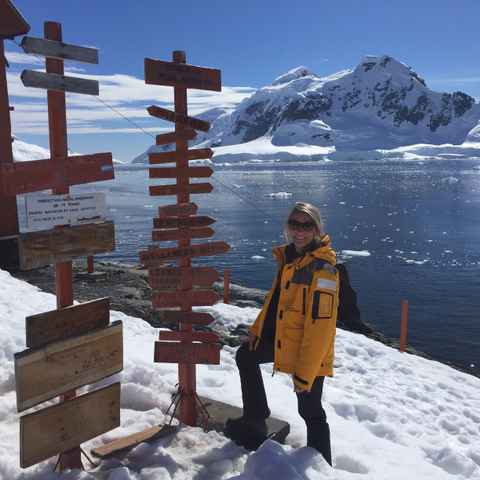 What's the weather like in Antarctica in December? December is typically marked by sunshine and blue skies with increasingly longer days of daylight, however, this is Antarctica and the odd whiteout can still occur. What wildlife can I see in Antarctica in December? By December the penguin rookeries are at full capacity and the birds are busy incubating their precious eggs. Hatching time differs on the Antarctic Peninsula between the three penguin species, and also different geographical location, but the later in December the better chances you have of seeing newly hatched chicks and hearing the particular 'keening' noise they make. Weddell, Crabeater and Leopard seals are commonly sighted in December in good numbers, typically hauled up on ice floes. Find out more about Antarctic wildlife by visiting our dedicated page. Is it cheaper to visit Antarctica in December? The key thing to note in December is that around mid-month (it differs between boat operators) the pricing steps up as high season begins. Those aware of this price watershed and who are flexible on dates can benefit from the best of both worlds: (a) travelling in the first two weeks of December under high season conditions, and (b) but at the lower shoulder season pricing. 'High season' is reflective of the better weather, more plentiful wildlife, longer days for exploring and sheer popularity, and runs from mid-December through to late February. Can I fly to Antarctica in December? Yes, charter flights from Punta Arenas in Chile to Antarctica begin in early December when the Chilean airfield on King George Island resumes operations. Flights operate through to mid-February. Snow conditions are usually good enough for snowshoeing up to Christmas, but can become challenging after that.